Government services start and end on GOV.UK. Except, at the moment, that's not usually true. We have consistent 'start' pages acting as the natural entry point for services, but the way users are handled once a transaction is complete is currently rather inconsistent. Sometimes, services link back to the home page. Sometimes they just thank the user. Sometimes they even have a 'close' button which closes the user's web browser. Until now, we haven't helped you enough here. Other than one generic 'done' page which some driving transactions link to (and Tom Loosemore recently blogged about some interesting multivariate testing we've been doing) we've not really had something on GOV.UK for your services to link back to after they're finished. A GOV.UK 'done' page is the twin of a 'start' page; it's a consistent format and it tells the user that they've finished the transaction. It's a useful place for us to capture satisfaction for the specific transaction or service they were using, meaning that individual services don't all need to create their own satisfaction surveys. The data captured will be reflected in the performance dashboard for each service, and comments will be shared with service managers. If a government service linked to from GOV.UK has a start page at www.gov.uk/something the done page will be www.gov.uk/done/something. Over the next few weeks, we'll put the finishing touches to this design, testing it and starting to roll them out on GOV.UK for all new services. The satisfaction data will be shared so that each service manager (and anyone else) can see the satisfaction measures for the service, in the same way that other metrics are already captured and shared through the performance dashboard. We'll ask for a nominated email address so we can automatically forward the feedback comments and ratings to the relevant service manager. Eventually, we also hope to offer useful onward journeys via the done page, offering people who have finished using one service a link to something else they might find helpful that they didn't necessarily know existed. This would be based on user behaviour and also, hopefully, departmental input about potentially useful next steps. We don't do this lightly, and outside of the home page, done pages are probably the only other bit of GOV.UK we'd expect to see this kind of cross-promotional navigation. The done page is the very final step after a user has finished interacting with the transaction, so it won't allow you to insert specific confirmation text. It's not the place to share confirmation numbers or outcome-dependent next steps for the service. That should all happen within the service itself. 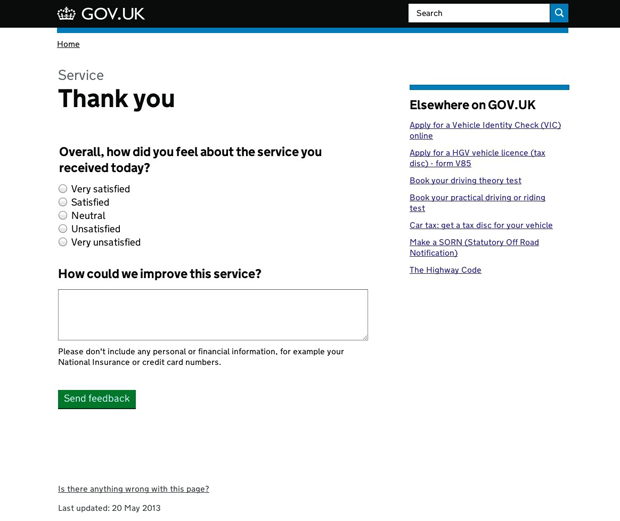 All new services start and end on GOV.UK, but we'd also love help from departments in linking back to these new done pages from your existing services too. Do let us know through a new ticket if we can add a new done page for any existing service that we already link to from a GOV.UK start page. When should you add change notes? MOJ have already incorporated this feedback facility within some of our beta services - in the header message about feeding back on the beta (eg court finder https://courttribunalfinder.service.gov.uk/). This makes for a more seamless user experience, and allows users to comment at any stage in their journey. Any data collected in a 'done' page will be biased in only counting those who've managed to complete the transaction. Moreover, for a lot of services it doesn't make sense to say that someone's 'finished'. For instance, they may want to look for details of more than one court, or to contact the court regarding a case. Thanks, Graham. As long as satisfaction data is surfaced through the performance platform then it shouldn't matter where it comes from. We had expected that some services would have their own approach for capturing satisfaction, and that some services would already be doing so. The survey on the done page is on by default, and is there to make it easy for service owners not to have to reinvent that functionality every time. Obviously, we'll need to be able to switch it off for services which are proactively seeking satisfaction feedback in other ways. I agree that the 'done' page route will only capture satisfaction from 'happy case' users who reached the final transaction, so we'd expect those services to need to consider multiple metrics in knowing whether the service is performing well or not. Hi Roo. Do you have a preferred means of linking to done pages from the end page of a transaction? I know we've discussed a 'Finish' button in the past - is this still our recommended approach? The very end of the final page of the transaction should link to the done page. Based on some useful data (https://insidegovuk.blog.gov.uk/2014/04/23/book-a-practical-driving-test-how-changing-the-wording-on-one-button-increased-clickthroughs-by-600/) we're currently recommedning 'Finished' as the text.